Mary Magdalen was demon possessed. Earlier this week, I mentioned that I hate the Proverbs 31 woman, mainly because her perfection causes me to feel guilty. These women, they do not make me feel guilty. When I read their stories, I am instead impressed with God’s ability to use anyone to bring about the works of His kingdom. They were sinners. They were failures. They were human. Why aren’t these the women that get discussed at Bible studies, women’s conferences and on Mother’s Day? Why are we always being reminded of the fantastic feats accomplished by Ms. Proverbs 31? Many of these women are in the family tree of Jesus. Many of these women accomplished great things for the Lord. All of these women were daughters of God. Yet their sin is what gets highlighted. They are labeled based on, what was for many, one action. One misstep, and they’re disqualified from the honor roll. Their guilt defines them. 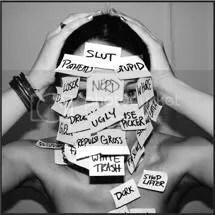 There are women I know who are working on moving past their labels: adulterer, addict, immoral, murderer. These women have turned from their previous ways, surrendered all to God and are now moving forward by sharing their stories to help others who are entangled in the same chains they were. We’ve been talking about guilt this week. Yesterday I asked you if it was easier for you to give grace to others than to receive it for yourself. So often we extend to others what we are not willing to accept for ourselves. God’s grace is sufficient for you. Through the work of Jesus on the cross, your sins have been forgiven and removed as far as the east is from the west. Not only are you forgiven, but you are changed. The name you have assigned to yourself. The box that others have put you in. Labels earned through this stumble or that failure. God has changed your name. What if I mess up again? What if people reject me because of my past? What will they think? Instead of worrying about these questions and more, we need to show them Jesus. set me free, changed my life, paid the price. And here’s hoping that in the future more of these women are held up as examples for us, or at least as frequently as Proverbs 31. That we don’t just hold up the positive stories of the Bible, but that we accentuate those negative stories that show God’s redemption and grace. What has God changed your name to? How have you embraced that change in your life? Technically Jael was a hero, it was war, and yes she did drive that spike through that generals head and all, but it was war. So not really murder. If she had tied him up all pretty and delivered him back home – they would have done it. Pretty much once she got to him he was a gonner. Shame on you for labeling !!!!!!!!!! I get that. But, wouldn’t you expect that there would be some sort of stigma (or label) attached to her for what she did. Although it was a time of war and he would have received the same treatment if captured, it was unusual for a woman to be the one who committed the act. :) But, yes, you’re right. Technically she wasn’t a murder. Totally got the point of your post though – and loved it. For a long time, I thought of myself as a “lesser” Christian. Having grown up in the church, saying the sinner’s prayer at the age of 3ish, I just don’t have an incredible story of change to share. But, our discussion at my small group this week taught me that it’s the daily change, the daily dying to self, that makes me CHANGED! No, I don’t have an extreme story of being redeemed from addiction, abuse, or adultery. But, I am still redeemed. I am still in need of His grace and mercy every single day, every single moment, to choose His ways over mine. It might not be a story fit for the movies, like Tamar, but it’s still a story that He has written for me. I have pretty much the same story and have felt similarly about my lack of a conversion. What a great lesson you learned! Regardless of where we start out, we’re all in need of His grace and mercy every single day. Amen to that! I’ve been labeled SO many things: liar, cheater, addict. My name is now: saved, redeemed, freed, LOVED, accepted. I’ve been through the ringer. But he finally took me out, ironed out the wrinkles, re-inflated the flat parts. I’m so grateful for that; because now I know when I go through the ringer, he’s on the other side waiting to revive me. Great post! Thank you Jesus that you continue to qualify those you call. Once I realized the God of the Universe was pursuing me and inviting me to join in His activity, my life was transformed. There’s nothing like it! ;) I’m so glad the ladies you mentioned above weren’t perfect either…that give so much hope and possibility for someone not perfect either…like me! Amen! He is pursuing us and does invite us in to what He’s doing. Thanks for sharing that thought. I would like to offer another perspective on the Pr 31 woman. The Pr 31 woman is a composite of virtuous women throughout the Bible. Everyone in her community knew that Ruth was a virtuous woman (Ruth 3:11). These women spoke wisdom and faithful instruction. (Pro 31:26). Others in her community had “full confidence” in the prophet Huldah’s ability to authenticate a very important book for the king. (2 king 22:14-20). Moses’ mom hid him. Moses may or may not have called her blessed, but Paul felt she was blessed and listed her in the Hebrew Hall of faith. (Heb 11:23). Like the Pro 31 woman, Lydia was a woman of noble character. The name “Lydia” means noble. None of these women were superwoman, but each was super and virtuous in her own way. Instead of looking at all the ways we might not measure up to the Pro 31, may we consider the traits that we have in common with her like the women mentioned above.